“If a fire, flood or other natural disaster damages your property, contact your insurance representative as soon as it is safe to do so. Immediately record – on paper and take photos – as many details as you can without endangering your personal safety. 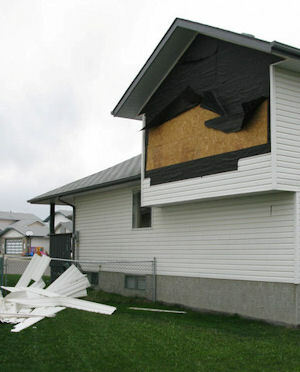 Home insurance covers damage from wind. This applies to damage to the outside of a building (except for antennas, satellite dishes, etc.). The interior of a building and its contents are covered only if the storm has first created an opening in the building (e.g., a broken window or damaged roof) through which the storm could enter. ​If the roof was already in a state of disrepair, insurance may not cover the damage.